A black and tan is created by blending a dark beer with a pale one. It's an occasional practice that can be traced back to the UK and one Cavalier decided to bring back as a one-off – at least initially. 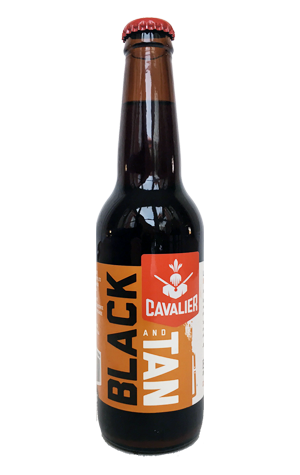 The combination of their imperial stout with their American style pale ale proved rather popular, however, so they kept doing it and, for winter 2017, decided to bottle it too. Those familiar with the individual beers will know the Imperial Stout is a pretty forceful affair, combining roasted barley and coffee characters with chocolate and dark fruits, while the Pale Ale sits in piney, fruity territory. Here, despite the former being the bigger beer, the hop character of the latter takes the beer into American stout territory, while making it leaner and lighter across the palate, reducing the impact of the roasted, darker malt characters and boosting the fruitiness. Indeed, you may be surprised by how much impact the smaller beer has.